Registration required. Valid for new subscribers only.There is no amount paid associated with this voucher, only a promotional value. Limit 1 per person, may buy 1 additional as a gift. 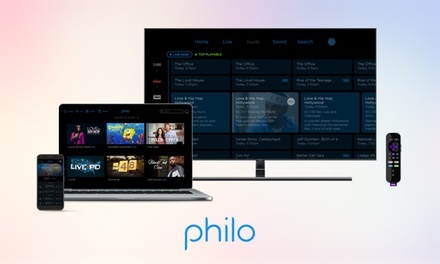 Claim codes cannot be resold, transferred for value, redeemed for cash, or applied to any other Philo account, except where required by law. This promotion may not be combined with other offers. Limit one per customer and account. To redeem, must register credit card with merchant. After the promotional period, plans will automatically renew unless canceled with merchant. Philo is only available in the US.